The Sound: An acoustic time capsule. Thoughtful reflections of a funnier, simpler time. Best Moments: The elementary school admiration through a cloud of eraser dust on “Not Like You” is absolutely divine, as is the chorus: “those girls were fine and did so nicely what they do / but not a one could pound erasers on the sidewalk like you / ’cause when you really got to going chalk dust swirled into the air / and it made the softest shades of pastel highlights in your hair / the others stared amazed at clouds of hazy yellow, white and blue / ’cause not a one could pound erasers on the sidewalk like you”. “Not Like You” may be my favorite song of the year. “Dodgeball” tells of more unrequited grade school love (really, the most romantic kind), again with a high level of wit as evidenced in the refrain “dodgeball / dodgeball / Mary sure is beautiful / but friend I wouldn’t tell her that / ’cause she’ll wind up hard / and you’ll wind up flat”. Bonus Thoughts: 100% of the proceeds from the sale of “Neil Brewer and Friends Are Back in School” CDs are being donated to The Harvard Stem Cell Institute to put an end to Muscular Dystrophy. Read all about Brewer’s contribution to the effort in Harvard’s 2009 Newsletter. Okay, Time to Wrap it Up with a Nice Little Bow: Music is an emotional art form. When good, it triggers passions and conjures up imagery capable of forcing the listener to confront demons, relive tragedy, remember romantic interludes or, possibly, flick a switch of inspiration for some future endeavor. Additionally, what’s so beautiful about good music is that sharing in an experience is not a prerequisite to having a song’s lyrics affect you. Despite having no fond memories of a girl from the 4th grade or ever wearing an athletic supporter and playing football, Neil Brewer has stirred something deep inside me. There is a time and a place captured so magnificently on “Neil Brewer and Friends Are Back in School”. It’s likely a different time and place from that which exists in your memory bank, but no matter, for there is an undeniable, crystal clear connection that exists between Brewer and the listener. This album will transport you back to wherever you belonged, however many years ago it was – to a time and a place when the sun shined brighter, the school bell rang truer and the world seemed a safer, less angry place. “Neil Brewer and Friends Are Back in School” is a warm, thoughtful and fantastic album, the creation of which is rooted in philanthropy, love and hope. This is CD you and your family should really consider buying, not only because you will, more than likely, enjoy the music but because through your purchase you’ll be helping to find a cure for Muscular Dystrophy. Pick up a physical copy of the disc or a digital download here (where you can also sample all the tunes). 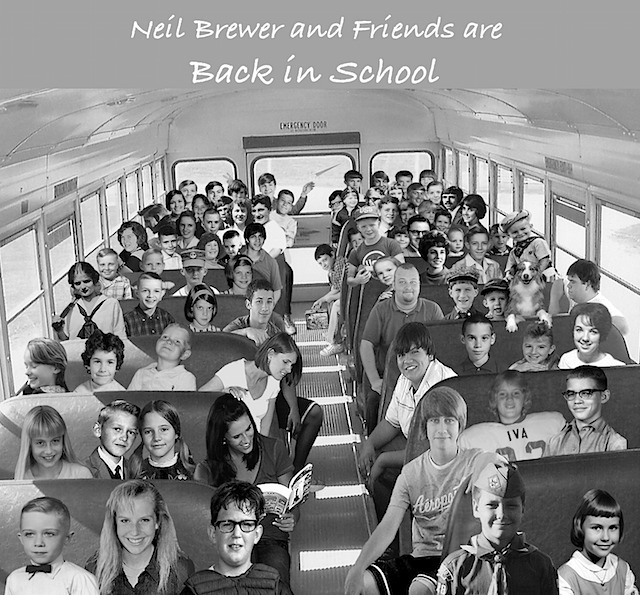 *The “Neil Brewer and Friends Are Back in School” CD was provided to OWTK for review. The opinions expressed above are unbiased and true – no arm twisting took place in the review process.